Elephants, a ringleader who’s a walking Ponzi scheme, and insults flying left and right—welcome to the Greatest Show on Earth. Yep, it finally happened. In early May, after a long, long run, the elephants of the Ringling Bros. and Barnum & Bailey Circus were ushered into retirement in Florida where they will finish their days aiding cancer research. The Greatest Show on Earth was done with its pachyderms. The same might be said about the Republicans after Donald Trump’s version of a GOP convention. Many of them had also been sent, far less gracefully than those circus elephants, into a kind of enforced retirement (without even cancer research as an excuse). 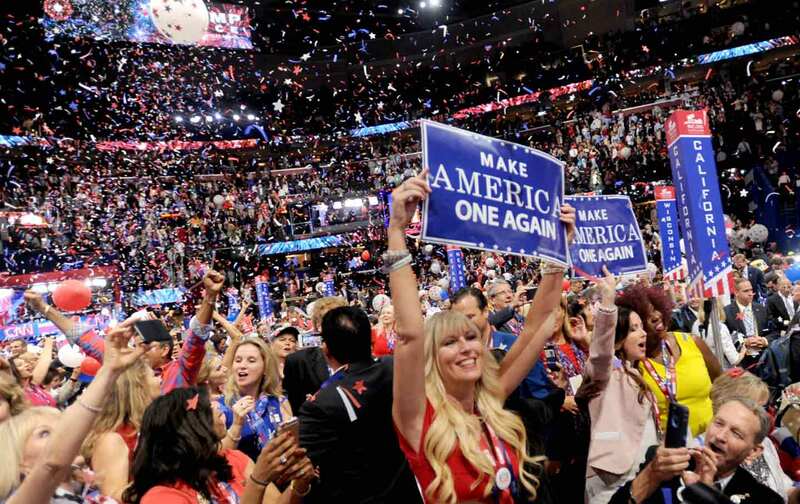 Their former party remained in the none-too-gentle hands of the eternally aggrieved Trump, while the Democrats were left to happily chant “USA! USA!,” march a barking retired four-star general and a former CIA director on stage to invoke the indispensable “greatness” of America, and otherwise exhibit the kind of super-patriotism and worship of the military usually associated with… no question about it… the GOP (whose delegates instead spent their time chanting, “Lock her up!”). My small suggestion: Don’t even try to think your way through all this. It’s the media equivalent of entering King Minos’s labyrinth. You’ll never get out. I’m talking about—what else?—the phenomenon we still call an “election campaign,” though it bears remarkably little resemblance to anything Americans might once have bestowed that label on. Still, look on the bright side: The Republican and Democratic conventions are in the rear-view mirror and a mere three months of endless yakking are left until Election Day. In the last year, untold billions of words have been expended on this “election” and the outsized histories, flaws, and baggage the two personalities now running for president bring with them. Has there ever been this sort of coverage—close to a year of it already—hour after hour, day after day, night after night? Has The New York Times ever featured stories about the same candidate and his cronies, two at a time, on its front page daily the way it’s recently been highlighting the antics of The Donald? Have there ever been so many “experts” of every stripe jawing away about a single subject on cable TV from the crack of dawn to the witching hour? Has there ever been such a mass of pundits churning out opinions by the hour, or so many polls about the American people’s electoral desires steamrollering each other from dawn to dusk? And, of course, those polls are then covered, discussed, and analyzed endlessly. Years ago, Jonathan Schell suggested that we no longer had an election, but (thanks to those polls) “serial elections.” He wrote that back in the Neolithic Age and we’ve come an awful long way since then. There are now websites, after all, that seem to do little more than produce mega-polls from all the polls spewing out. And don’t forget the completely self-referential nature of this “campaign.” If ever there was an event that was about itself and focused only on itself, this is it. Donald Trump, for instance, has taken possession of Twitter and his furious—in every sense, since he’s the thinnest-skinned candidate ever—tweets rapidly pile up, are absorbed into “news” articles about the campaign that are, in turn, tweeted out for The Donald to potentially tweet about in a Möbius strip of blather. And yet, despite all the words expended and polls stumbling over each other to illuminate next to nothing, can’t you feel that there’s something unsaid, something unpolled, something missing? As the previous world of American politics melts and the electoral seas continue to rise, those of us in the coastal outlands of domestic politics find ourselves, like so many climate refugees, fleeing the tides of spectacle, insult, propaganda, and the rest. We’re talking about a phenomenon that’s engulfing us. We’re drowning in a sea of words and images called “Election 2016.” We have no more accurate name for it, no real way to step back and describe the waters we’re drowning in. And if you expect me to tell you what to call it, think again. I’m drowning, too. You can blame Donald Trump for many things in this bizarre season of political theater, but don’t blame him for the phenomenon itself. He may have been made for this moment with his uncanny knack for turning himself into a never-ending news cycle of one and scarfing up billions of dollars of free publicity, but he was a Johnny-come-lately to the process itself. After all, he wasn’t one of the Supreme Court justices who, in their 2010 Citizens United decision, green-lighted the flooding of American politics with the dollars of the ultra-wealthy in the name of free speech and in amounts that boggle the imagination (even as that same court has gone ever easier on the definition of political “corruption”). As a certified tightwad, Trump wasn’t the one who made it possible to more or less directly purchase a range of politicians and so ensure that we would have our first 1 percent elections. Nor was he the one who made American politics a perfect arena for a rogue billionaire with enough money (and chutzpah) to buy himself. It’s true that no political figure has ever had The Donald’s TV sense. Still, before he was even a gleam in his own presidential eye, the owners of cable news and other TV outlets had already grasped that an election season extending from here to Hell might morph into a cornucopia of profits. He wasn’t the one who realized that such an ever-expanding campaign season would not only bring in billions of dollars in political ads (thank you, again, Supreme Court for helping to loose Super PACs on the world), but billions more from advertisers for prime spots in the ongoing spectacle itself. He wasn’t the one who realized that a cable news channel with a limited staff could put every ounce of energy, every talking head around, into such an election campaign, and glue eyeballs in remarkable ways, solving endless problems for a year or more. This was all apparent by the 2012 election, as debates spread across the calendar, ad money poured in, and the yakking never stopped. Donald Trump didn’t create this version of an eternal reality show. He’s just become its temporary host and Hillary Clinton, his quick-to-learn apprentice. And yet be certain of one thing: neither those Supreme Court justices, nor the owners of TV outlets, nor the pundits, politicians, pollsters, and the rest of the crew knew what exactly they were creating. Think of them as the American equivalent of the blind men and the elephant (and my apologies if I can’t keep pachyderms out of this piece). In this riot of confusion that passes for an election, with one candidate who’s a walking Ponzi scheme and the other who (with her husband) has shamelessly pocketed staggering millions of dollars from the financial and tech sectors, what are we to make of “our” strange new world? Certainly, this is no longer just an election campaign. It’s more like a way of life and, despite all its debates (that now garner National Football League–sized audiences), it’s also the tao of confusion. Of course, such slaughters, when they do break through the election frenzy, only feed the growth of the campaign. It’s a reasonable suspicion, though, that somewhere at the heart of Election 2016 is a deepening sense of fear about American life that seems to exhibit itself front and center only in relation to one of the lesser dangers (Islamic terrorism) of life in this country. Much as this election campaign offers a strife-riven playing field for two, it also seems to minimize the actual strife and danger in our world by focusing so totally on ISIS and its lone wolf admirers. It might, in that sense, be considered a strange propaganda exercise in the limits of reality. Let’s take, for instance, America’s wars. Yes, the decision to invade Iraq has been discussed (and criticized) during the campaign and the urge of the two remaining candidates and everyone else previously involved to defeat and destroy the Islamic State is little short of overwhelming. In addition, Trump at least has pointed to the lack of any military victories in all these years and the disaster of Clinton’s interventionist urge in Libya, among other things. In addition, in an obvious exercise of super-patriotic fervor of the sort that once would have been strange in this country and now has become second nature, both conventions trotted out retired generals and national security officials to lecture the American public like so many rabid drill sergeants. Then there were the usual rites, especially at the Democratic convention, dedicated to the temple of the “fallen” in our wars, and endless obeisance to the “warriors” and the US military generally—as well as the prolonged Trumpian controversy over the family of one dead Muslim-American Marine. One of the two candidates has made a habit of praising to the heavens “the world’s greatest military” (and you know just which one she means) while swearing fealty to our generals and admirals; the other has decried that military as a “disaster” area, a “depleted” force “in horrible shape.” For both, however, this adds up to the same thing: yet more money and support for that force. Here’s the strange thing, though. Largely missing in action in campaign 2016 are the actual wars being fought by the US military or any serious assessment of, or real debate or discussion about, how they’ve been going or what the national security state has or hasn’t accomplished in these years. Almost a decade and a half after the invasion of Afghanistan, the longest war in American history is still underway with no end in sight and it’s going badly, as American air power has once again been let loose in that country and Afghan government forces continue to lose ground to the Taliban. Think of it as the war that time forgot in this election campaign, even though its failed generals are trotted out amid hosannas of praise to tell us what to do in the future and who to vote for. Meanwhile, a new, open-ended campaign of bombing has been launched in Libya, this time against ISIS adherents. The last time around left that country a basket case. What’s this one likely to do? Such questions are largely missing in action in campaign speeches, debates, and discussions; nor is the real war and massive destruction in Iraq or Syria a subject of any genuine interest; nor what it’s meant for the “world’s greatest military” to unleash its air power from Afghanistan to Libya, send out its drones on assassination missions from Pakistan to Somalia, launch special operations raids across the Greater Middle East and Africa, occupy two countries, and have nothing to show for it but the spread of ever more viral and brutal terror movements and the collapse or near-collapse of many of the states in which it’s fought its wars. At the moment, such results just lead to “debates” over how much further to build up American forces, how much more money to pour into them, how much freer the generals should be to act in the usual repetitive fashion, and how much more fervently we should worship those “warriors” as our saviors. Back in 2009, Leon Panetta, then head of the CIA, talked up America’s drone assassination campaign in Pakistan as “the only game in town” when it came to stopping Al Qaeda. Seven years later, you could say that in Washington the only game in town is failure. Similarly, the US taxpayer pours nearly $70 billion annually into the 16 major and various minor outfits in its vast “intelligence” apparatus, and yet, as with the recent coup in Turkey, the US intelligence community seldom seems to have a clue about what’s going on. Failed intelligence and failed wars in an increasingly failed world is a formula for anxiety and even fear. But all of this has been absorbed into and deflected by the unparalleled bread-and-circus spectacle of Election 2016, which has become a kind of addictive habit for “the people.” Even fear has been transformed into another form of entertainment. In the process, the electorate has been turned into so many spectators, playing their small parts in a demobilizing show of the first order. And speaking about realities that went MIA, you wouldn’t know it from Election 2016, but much of the United States was sweltering under a “heat dome” the week of the Democratic convention. It wasn’t a phrase that had previously been in popular use and yet almost the whole country was living through record or near-record summer temperatures in a year in which, globally, each of the first six months had broken all previous heat records (as, in fact, had the last eight months of 2015). Even pre-heat dome conditions in the lower 48 had been setting records for warmth (and don’t even ask about Alaska). It might almost look like there was a pattern here. Unfortunately, as the world careens toward “an environment never experienced before,” according to the National Oceanic and Atmospheric Administration, one of the two parties to the American spectacle continues to insist that climate change is a hoax. Its politicians are almost uniformly in thrall to Big Energy, and its presidential candidate tops the charts when it comes to climate denialism. (“The concept of global warming,” he’s claimed, “was created by and for the Chinese in order to make US manufacturing non-competitive.”) Meanwhile, the other party, the one theoretically promoting much-needed responses to climate change, wasn’t even willing to highlight the subject in prime time on any of the last three days of its convention. In other words, the deepest, most unnerving realities of our world are, in essence, missing in action in election 2016. You want to be afraid? Be afraid of that! So you tell me: What is this spectacle of ours? Certainly, as a show it catches many of our fears, sweeping them up in its whirlwind and then burying them in unreality. It can rouse audiences to a fever pitch and seems to act like a Rorschach test in which you read whatever you’re inclined to see into its most recent developments. Think of it, in a sense, as an anti-election campaign. In its presence, there’s no way to sort out the issues that face this country or its citizens in a world in which the personalities on stage grow ever larger and more bizarre, while what Americans have any say over is shrinking fast. So much of American “democracy” and so many of the funds that we pony up to govern ourselves now go into strengthening the power of essentially anti-democratic structures: a military with a budget larger than that of the next seven or eight countries combined and the rest of a national security state of a size unimaginable in the pre-9/11 era. Each is now deeply embedded in Washington and at least as grotesque in its bloat as the election campaign itself. We’re talking about structures that have remarkably little to do with self-governance or We the People (even though it’s constantly drummed into our heads that they are there to protect us, the people). In these years, even as they have proved capable of winning next to nothing and detecting little, they’ve grown ever larger, more imperial, and powerful, becoming essentially the post-constitutional fourth branch of government to which the other three branches pay obeisance.